﻿ Alexander, Frank. 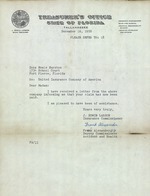 signed typewritten letter to Zora Neale Hurston Tallahassee. (1p. 8 1/2 x 11). United Insurance Company of America Claim. Alexander, Frank. signed typewritten letter to Zora Neale Hurston Tallahassee. (1p. 8 1/2 x 11). United Insurance Company of America Claim. I am pleased to have been of assistance.